The Bankeside Schoole of Defense treats our program like a martial art. Apprentice Scholars are first introduced to the concepts of balance, line, eye contact, distance and timing. They are taught the basics of stance and footwork combined with balance and line. In addition they learn to respect the weapon, our fellow students and instructors.The rapier is the first weapon taught to beginners as it is the belief that once competency is achieved with the single rapier and all the concepts, all other forms of weapon play are easier to learn. It is said that in order to fully integrate a physical movement into muscle memory that one needs to perform the same movement 7423 times. One of the main aspects of our school is repetition in which the students are constantly drilled with the physical techniques and movement in order to build that memory. When the footwork is established the students then start to work with the sword itself starting with the Ward or Guard positions moving into parries and blocks with the weapon. Once those concepts are introduced and continued, the Apprentice Scholar is then started to work on the various cuts and finally onto thrusts with the rapier. These movements and techniques are practiced heavily over time and once the instructor is pleased, the Apprentice Scholar is then given a progress report. Once all the techniques are performed to satisfaction, the Apprentice Scholar may then petition to "Play the Prize". The "Playing of the Prize" is an event in which the Apprentice Scholar publicly performs our "Scholar's Routine" to show competency with the sword. Successful completion for the playing results in the participant being granted the title of "Scholar". After being granted the title of Scholar, further training is then assumed including fight choreography and our "A Tiempo" exercises. 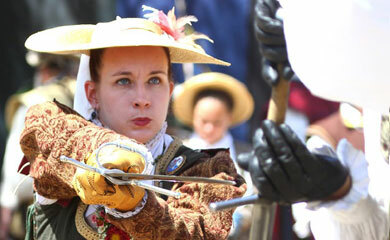 Companion weapons to the rapier are introduced and training is done rigorously with those. Additional weapon systems are also conducted to include broad and backswords, longsword, quarterstaff and 18th century smallsword. After several years of study a student may then again "Play for the Prize". This time for the rank of Free Scholar. The Free Scholar rank requires an essay to be written on some subject of swordsmanship or 16th century weapon. The student then must perform an hour long "A Tiempo" event where s/he takes on all challengers (those trained and approved by one of our instructors). The challenge is not to score hits off the opponents, but to show that the student has mastered enough control of his blade to continue with proper timing, distance and form even when exhausted. A daunting task when most fights would only last a matter of minutes.